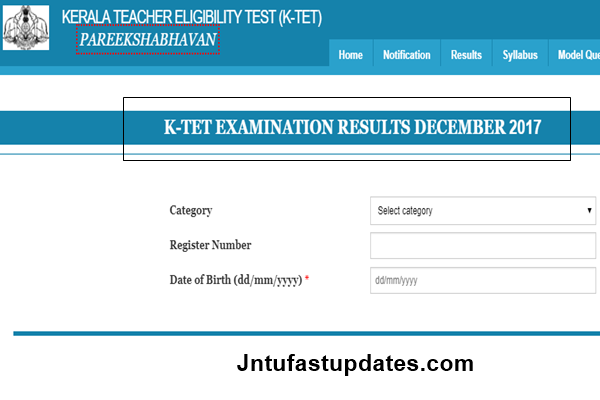 Kerala TET Result June 2018: Pareekshabhavan Kerala are released the Teacher Eligibility Test (KTET) Exam Result 2018 on its official website at ktet.kerala.gov.in. Candidates those have attempted the KTET Exam can check the Kerala TET 2018 Result, cutoff Marks, merit list. The Kerala Pareeksha Bhavan has conducted the TET Examination on 23rd & 30th June for aspirants desirous to become primary and secondary school teacher. Huge numbers of hopefuls have taken the Kerala TET Examination for Category 1, Category 2, Category 3 and Category 4 Vacancies. The examination has been held in many examination centres of Kerala. Aspirants those have attempted the Kerala TET Examination can check their result, cutoff marks from the KPE official page, keralapareekshabhavan.in. The Kerala Teacher Eligibility Test is the annual test conducted by Pareekshabhavan kerala. As the name indicates, this examination is mainly intended for aspirants seeking to become a school teacher for primary and secondary classes. Hopefuls clearing this examination with good merit can get opportunities to work with best schools across the state with good package. Candidates aspiring to become teacher for class I to Class V have to clear the Kerala TET Examination Paper 1 and candidates aspiring to become teacher for higher classes for Class VI to Class VIII have to clear the Paper 2 examination with good merit. Also candidates having the eligibility to attempt the both papers can also attempt KTET examination for both. In the state of Kerala few of the hopefuls have attempted both the papers. So, those candidates can also check their results for both papers. Cutoff Marks of Kerala TET examination has been released by the conducting authority. Candidates must score the minimum cutoff marks to qualify in the examination. Aspirants who are been waiting for Kerala TET Cutoff Marks 2018 can immediately switch to the official website, keralapareekshabhavan.in to check the marks. On the homepage check for K-TET EXAMINATION RESULTS June 2018 tab. Click on it, and enter the details of Register Number, DOB etc,. Finally Submit the details by selecting the submit button down to the details. I will write all answers to the question. But I will get the result disqualified. Why? I will write all answers to all questions. But I get the result disqualified. Why? When will the certificate verification be held and where? Can't the cutoff be 85! When will be appointments will be given to ktet 2018 qualified candidates? If there is one mark shortage on result.ie the passing marks is 90 and I get 89.then I couldn’t pass the exam???? ?